FUMC eNews is published every Thursday. FUMC Weekly is published every Sunday. Deadline for submission for both is 10:00 a.m. on the Wednesday two weeks prior. Please send submissions to tami@fumcaustin.org using the form below. If you do not receive a confirmation email or if you do not have email access, contact Tami Kellberg at 512-478-5684 (ext. 226). Editorial guidelines for FUMC Weekly are available at this link. Every Thursday, our FUMC eNews is sent out via email covering highlights for the upcoming week. 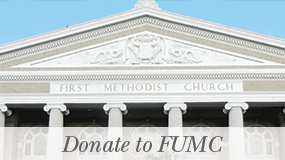 Please subscribe now if you wish to receive FUMC eNews. The FUMC Weekly is included with the printed Worship bulletin and is intended to keep members and visitors informed and involved with upcoming events and news. Several times a year, a printed newsletter is available at the 9:00 a.m. and 11 a.m. Sanctuary services. Join a Lenten Study Group!